Misname an art form and you consign its exponents to decades, sometimes centuries, of condescension and indifference. Two exhibitions opening in Mumbai this fortnight may help undo the damage deliberate acts of misnaming and misinterpretation have done to contemporary art that is produced by artists who happen to be of tribal or more broadly rural background. Likewise, the Chemould Prescott Road show finds gallerist Shireen Gandhy continuing a commitment to non-metropolitan art that characterized the gallery practice of her parents, Kekoo and Khorshed Gandhy, who have shown work by Mithila, Warli and Gond artists since the 1970s. Shyam, who committed suicide in mysterious circumstances in Japan in 2001, was an early protégé of Swaminathan’s, and his family has extended his legacy. Tragically, despite the diversity of sources on which these artists draw, and the spectrum of political and environmental concerns that animate their work, they are still subjected to a crude ethnographism by urban viewers who ought to know better. The killer words most commonly employed to constrict the scope of these artists are “tribal", “craft", “traditional" and “folk". As a lineage of theorists and curators, including Swaminathan, Jyotindra Jain, Gulammohammed Sheikh and Nancy Adajania, have demonstrated, these descriptions are worse than useless. Generated from the typological obsessions of colonial ethnography, these labels have long been responsible for a dreadful incarceration. They have reduced thousands of individuals to the happenstance of birth, registering them primarily as bearers of community identities rather than as citizens of a republic. And, once circumscribed as Warlis, Bhils or Gonds, these individuals have had to mortgage their free-floating, self-renewing imaginative energies to the regime of the emporium. The designation “tribal" froze vibrant communities into stigmatizing categories, branding them as hereditary criminals, incorrigible nomads or ignoble savages, while the colonial-industrial regime helped itself to their forests, rivers and mountains. From this repressive viewpoint, we arrive at the belief that the tribals are backward people whose energies are caught up with the mythic rhythms of nature. We thus rob them of all agency as legitimate contributors to the project of modernity. The term “craft" is absurd, if applied to the work of these artists. Crafts correctly designate the arts of everyday life, whether basket-making or the adornment of bodies and homes. The expressions that we see in the Pundole and Chemould exhibitions are partly rooted not in any craft, but in the ritual and ceremonial arts of rural communities. But this is not a simple continuity or persistence of “tradition" either: The relay between past and present is intricately layered. For instance, commentators sold on the “tradition" or “folk" models have called Shyam a practitioner of “Gond art". But there was really no Gond art before him. 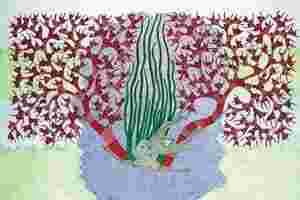 His art is correctly described by the critic Udayan Vajpeyi as the “Jangarh style". He and the other artists in these two exhibitions have drawn on Gond songs, but also on Warli figuration, on clues offered by kantha embroidery from eastern Bihar and Bengal, as well as on the ari, aabhla and suf embroidery idioms of Kutch. Having travelled and exhibited on the global circuit of alternative art, some of these artists have also been exposed to the work of their contemporaries from elsewhere. Motifs from contemporary Australian Aboriginal art surface, with assured elegance, in the works of the artists in Now That the Trees Have Spoken. Indeed, the protagonists of Now That the Trees Have Spoken represent what I have called an emergent third field of artistic production in contemporary Indian culture that is neither metropolitan nor rural, neither (post) modernist nor traditional, neither derived from academic training nor inherited without change from tribal custom. Indeed, third-field artists draw their energies from the adroit, dynamic management of knotty paradoxes. Now That the Trees Have Spoken Part I will show until 14 August and Part II from 17 August to 7 September at the Pundole Art Gallery; and Jangarh Singh and Family opens at Chemould Prescott Road on 4 August. Ranjit Hoskote is a Mumbai-based writer and independent curator. He is the author of 16 books, including Kampfabsage.